The anniversary edition for all choirs! With their extensive forces and complex parts, the performance of Beethoven's choral-symphonic works is hugely demanding for many choirs. For the major Beethoven anniversary in 2020 Carus is therefore expanding the repertoire of works available for mixed choirs. 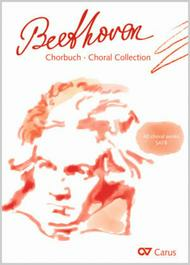 The Choral Collection Beethoven (ed. Jan Schumacher) contains especially attractive arrangements of Beethoven's music from three centuries. Contents include the choral-symphonic repertoire in versions with piano accompaniment, some lesser-known unaccompanied works, and some seldom-performed works, such as pieces from his incidental music. During his lifetime Beethoven was so admired that contemporaries arranged his music - mainly the well-known instrumental works - for chorus. Some of these choral works were even performed at Beethoven's own funeral. Subsequent generations of composers have also immersed themselves in Beethoven's output. In addition, for the anniversary Carus has commissioned choral arrangements of Beethoven's works from several contemporary composers. The Choral Collection Beethoven contains around 40 secular and sacred choral movements in a wide range of styles. Editor Jan Schumacher has created an indispensable resource with the Beethoven Choral Collection, particularly for amateur choirs, but the edition is also suitable for vocal ensembles and chamber choirs. Guaranteed enjoyment of Beethoven's music well beyond the anniversary year. * around 40 choral settings for SATB, some with piano accompaniment * well within the capabilities of amateur choirs * suitable for concerts, church services, and many social occasions * also contains arrangements of Beethoven's vocal and instrumental works from three centuries, by composers including Gottlieb Benedict Bierey, Heribert Breuer, Peter Cornelius, Gunnar Eriksson, Gunther Martin Gottsche, Clytus Gottwald, John Hoybye, Hans Georg Nageli, Peter Schindler, Ignaz Ritter von Seyfried, Friedrich Silcher, and many others * CD with selected works included with the conductor's score (Deutscher Jugendkammerchor, conducted by Florian Benfer) * economical choral edition (editionchor) available Contents (selection) * Choruses and canons: Auld Lang Syne, Gluck zum neuen Jahr, and Das Reden / Schweigen and many more. * Historic arrangements for chorus, including from the Moonlight Sonata, the Appassionata, the 7th Symphony, and many other works. * New arrangements for chorus, including the songs Bitten, Ich liebe dich, Marmotte, and many others. * Arrangements for chorus and piano, including the choral movements from the Choral Fantasia, the oratorio Christus am Olberge and the incidental music Die Ruinen von Athen, and the finale of the 9th Symphony.